The first model, RPzB 43, was164cm long and weighed 9.25kg (empty). This was succeeded by the RPzB 54 in October 1943, which had a blast shield and weighed 11kg (empty). Unlike the U.S. M6, the German rocket was still burning after leaving the muzzle. 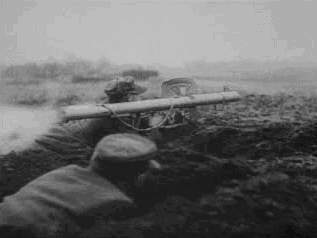 It also created a tremendous amount of smoke, leading German troops to dub it the Ofenrohr ("Stove Pipe"). 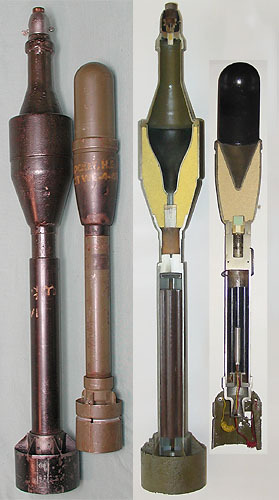 The HEAT rocket for the 88mm Panzerschreck, was made in two models (different propellant). The RPzB.Gr.carried a shaped charge of 660g and weighed 3.30kg and had a practical range of about 180m. At a 60/ impact angle it is stated that it could penetrate 160mm (6.3 in.) of armor. It had a special PD fuze “AZ 5095/1" with safety pin. Here is is the 88mm Panzerschrek next to the U.S. 2.36" (60mm) Bazooka. Overall, the German design almost doubled the weight of the U.S. M9A1. While increasing the penetration performance by about 50%, effective range was reduced by about one third, to150m (200yds). Trade-offs between range and performance, combined with the significant disadvantage of the cumbersome two-man operating team was quickly recognized. Forseeing this rocket system as a limited concept, German designers continued refining another shoulder launched anti-tank weapon, the famous Panzerfaust. That simple weapon would become the fore runner of a new breed of recoilless light antitank weapons (LAWs). I recommend this web site for some fantastic cut-away displays, two small versions shown here. On the site are some much larger images. Comparision to the Post War U.S. 3.5" "Super Bazooka"
While Germany abandoned the Bazooka concept during the war U.S. designers continued development, resulting in the 3.5 in. (89mm) "Super Bazooka". While too late for WWII it served well in Korea and into the 1970's. It could defeat 11 in. (280mm) armor with point accuracy to 400yards.